This is a white 1 inch pin badge with I Love Berlin in black test and a red heart. Berlin is such a popular city to visit and a wonderful, vibrant part of Germany. I know I Love Berlin and always get excited to visit. 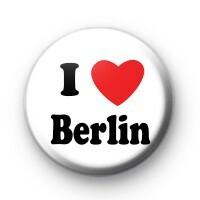 This is a lovely badge for anyone that is either from Berlin or that fell in love with the City on a trip or holiday.